I know most Apple enthusiasts will be rolling their eyes with my analysis and that’s fine because the rest of us need people to buy our shares as we unload long positions or sell Apple short ?. Every “good” stock will eventually become a bad one and vice versa. There are however good trades; trades that reward an investor who has correctly anticipated a move and positioned himself accordingly. Stage 1 – After a period of decline a stock consolidates at a contracted price range as buyers step into the market and fight for control over the exhausted sellers. Price action is neutral as sellers exit their positions and buyers begin to accumulate the stock. Stage 2 – Upon gaining control of price movement, buyers overwhelm sellers and a stock enters a period of higher highs and higher lows. A bull market begins and the path of least resistance is higher. 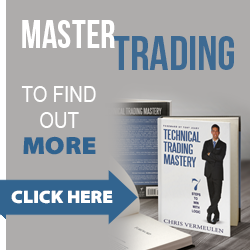 Traders should aggressively trade the long side, taking advantage of any pullback or dips in the stock’s price. Stage 3 – After a prolonged increase in share price the buyers now become exhausted and the sellers again move in. This period of consolidation and distribution produces neutral price action and precedes a decline in the stock’s price. 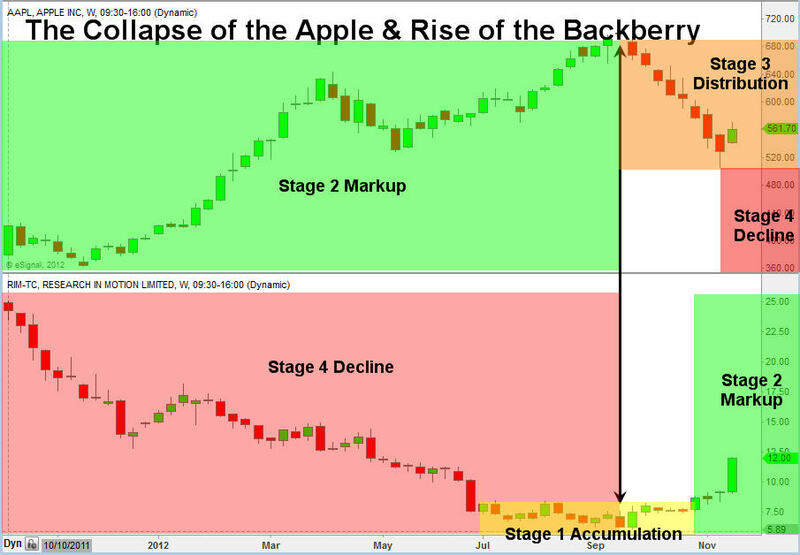 Stage 4 – When the lows of Stage 3 are breached a stock enters a decline as sellers overwhelm buyers. A pattern of lower highs and lower lows emerges as a stock enters into a bear market. A well-positioned trader would be aggressively trading the short side and taking advantage of the often quick declines in the stock’s price. More times than not all of stage 2 gains are given back in a short period of time. 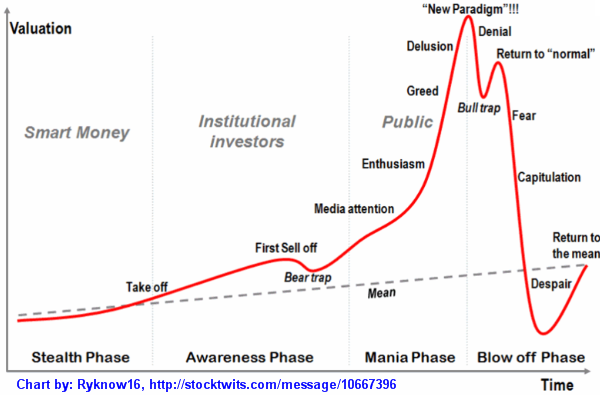 While these stages are historically defined over long time periods they actually exists in all time frames, allowing traders to take advantage of a cycle regardless of their trading time frame. Fortunately this phenomenon, known as a “fractal”, exists within all security markets. A fractal is simply a rough geometric shape that can be subdivided into smaller parts that have the same properties; a smaller version of the whole. 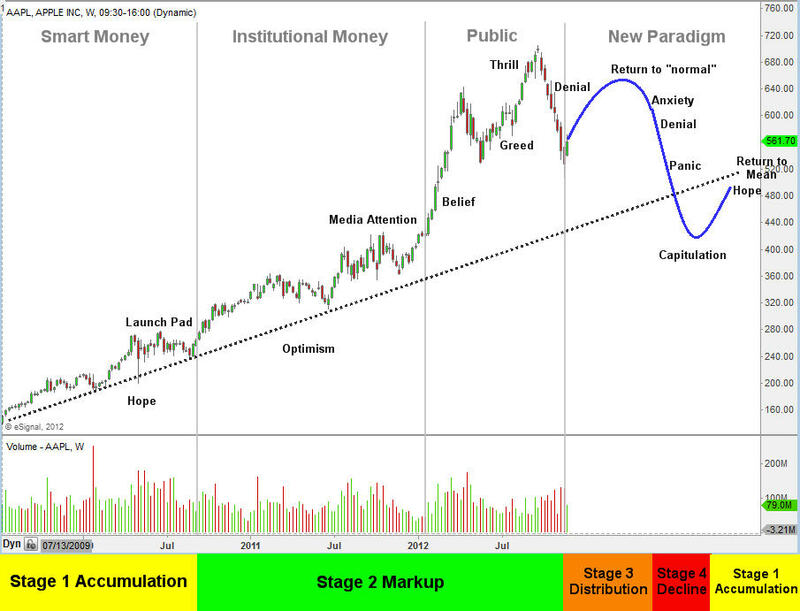 The Four Stages Profile: This signature profile happens over and over again in the market and all the great leaders eventually become laggards. Investment securities (stocks, ETF’s, options, futures) can be described as being similar to different types of athletes, each with their own unique style and personality. Some can be characterized as sprinters, participating in quick bouts of movement but tiring quickly. Others could said to be more similar to a marathoner, enduring prolonged courses in one direction without pause or interruption. History has an uncanny ability to repeat itself. Whether it’s the rise and fall of an empire or the rise and fall of a stock, there are clear cycles that are prevalent throughout history. Upon conducting such analysis it can at times seem that markets are be behaving “irrationally” and out of order. 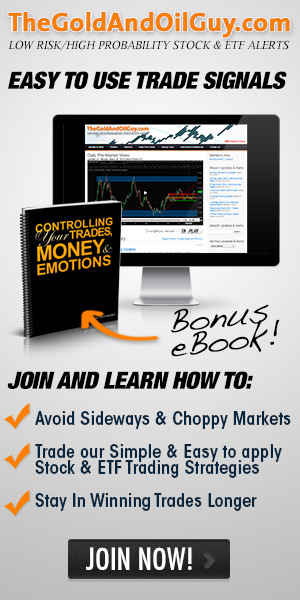 Undisciplined traders often fall victim to their emotions and lose control of their objectivity. As people behave irrationally, so too does the market, and unfortunately these conditions can persist for long period of times. John Maynard Keynes is often quoted for suggesting that “The markets can remain irrational longer than you can stay solvent.” This is a harsh reality and puts great emphasis on the importance of discipline, risk management, and a keen eye for price action. There will ultimately be times where you can’t control your emotions; however you can always control how you respond to them. Any time you recognize that your emotions are influencing your outlook you are already one step ahead of the average market participant. It is at this point that you step back, refocus your perceptions, examine the price action, and then take the appropriate action. An understanding of herd or mob mentality is important in trading and can provide you with an edge over the average participant who doesn’t contemplate what is happening around them. In a mob or riot, we never know what the feelings and motivations are of all the individual participants. There are however certain emotions that seem to appear at distinct times and a certain predictability in their development. A stock’s price action is no different. While we never know the underlying feeling and motivations of all participants, there are distinct emotions that are shared by the herd at various stages of a stock’s life. An understanding of these emotions and their implications on the price action of a stock is an advantage that the profitable trader maintains. It is very interesting that AAPL shares topped the same week rim shares bottomed. Could the BB10 be the turnaround for Research in Motion? Either way the market is somewhat predictable as traders and investors buy the rumor that BB10 will be good, and they sell the news once it arrives no matter the outcome good or bad. 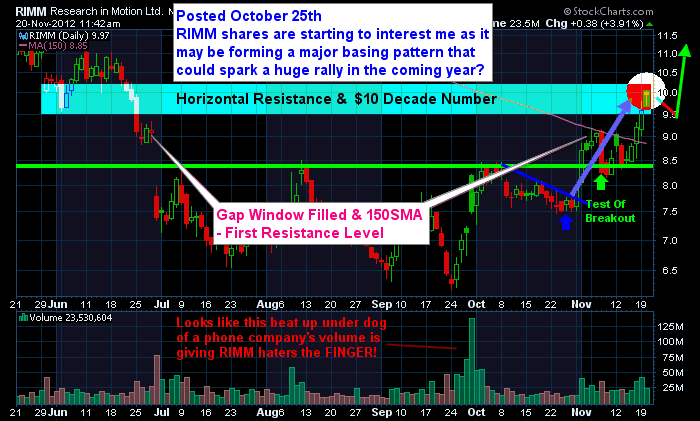 Jan 30th is when it’s unveiled so we could see RIM shares continue to claw its way out of the grave. The equities market technically still has another day of positive momentum behind it and with a short holiday week higher prices are favored. 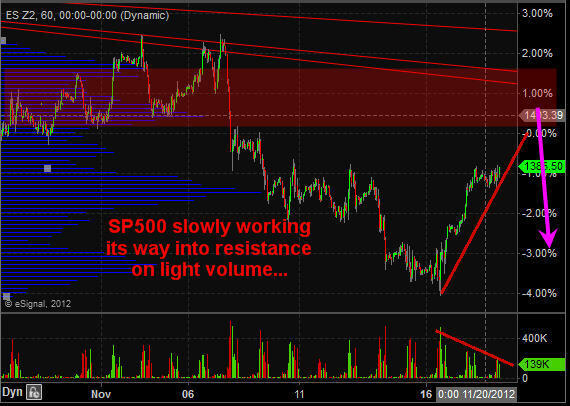 SP500 (broad market) continues to grind sideways/higher today. Volume is very light which bodes well for lower prices in the coming days. I would love to see a Pop-N-Drop tomorrow which is when the index gaps higher at the open into a resistance zone at which point we would be looking to get short (buy the SDS). 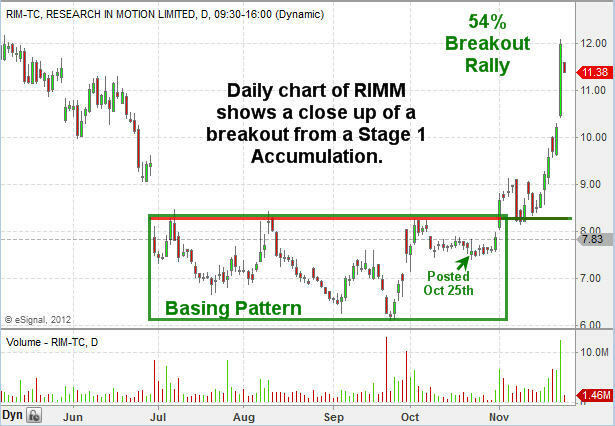 Research In Motion shares hit our first resistance level after being upgraded this morning…. 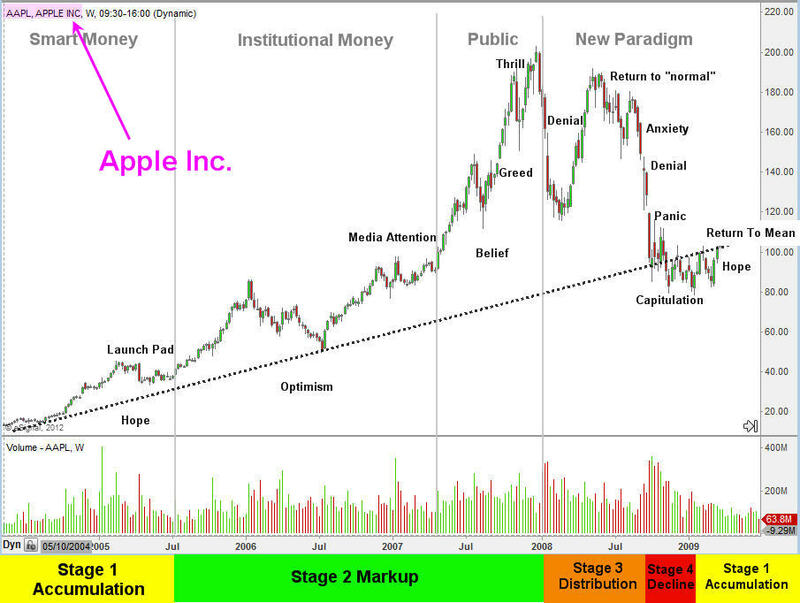 Buy the rumor sell the news…? If you are long taking some money off the table here is smart play and to move your stop to break even or better. 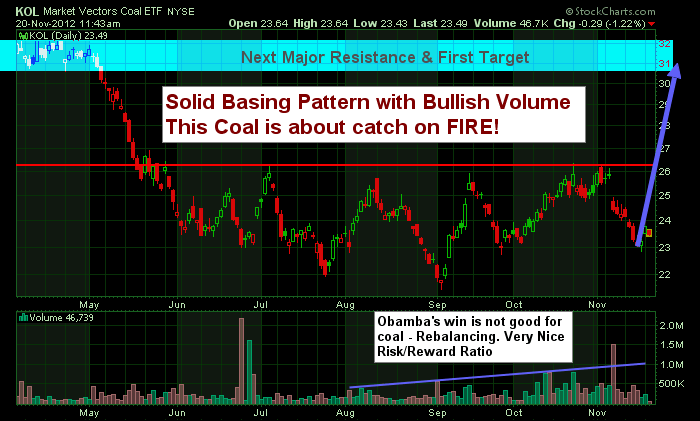 Coal sector is looking tasty today and we may take a long position in KOL, but I will update if I do so.